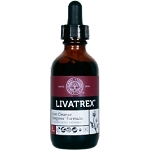 Living Streams Multi-Blend Liquid Probiotic is a natural by-product of friendly bio-organisms (probiotics) that have been specially cultured and developed to produce the natural anti-infective substances the human body was meant to receive from flora in the intestinal tract. However, because of processed foods, (for both humans and animals) lack of enzymes and other nutrients, poor quality intestinal flora and other health stresses, even the normal amounts of these substances that would otherwise be there are missing in most animals and people. On top of that, because the friendly bacteria are missing from the intestinal track growth of "bad" bacteria, fungus, yeast, virus and mold colonies can seriously harm health. Even if you think you are healthy, subclinical infective processes are at work, slowly damaging your health. 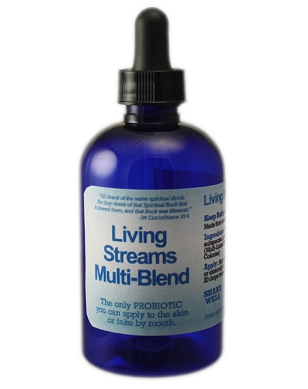 Living Streams Multi-Blend Probiotic is a totally NEW, unique friendly flora liquid solution. 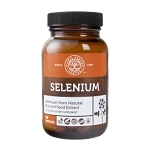 This product is the direct result of years of research and development, and could well be one of the most beneficial biological products in support of good health ever discovered. The secret is in the "solution" the friendly flora produce, NOT in the bacteria themselves or the quantity of bacteria. This is what sets Living Streams Multi-Blend apart from all other probiotic products. 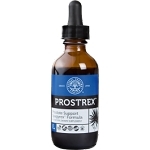 This product is NOT a full spectrum probiotic, although it does contain the original bacterial which produced the Living Streams Probiotic™ solution, and grow in the intestinal area, which is many times as powerful as any probiotic product can produce in the body naturally. Bacteria have long been known to benefit human health via their production of natural substances. Living Streams Multi-Blend Probiotic is a solution made from all natural probiotic... naturally occurring organisms in many foods... but it is specially formulated and processed to "super activate" their natural bio-production of beneficial substances that supports the immune system against infective agents such as mold, fungus, yeast, viral components and bacteria. Application: Start with 1-2 drops one time per day by mouth or externally to skin. Pregnancy: Do not use this product if you are pregnant or nursing. Ingredients: Water. Lactobacillus Paracasei & Subspecies of Paracasei, Lactobacillus Curvatus and "The Mother" (Multi-Linked Bacillus grouped together creating Colonies). Living Streams probiotics only contain organic lab certified bacteria species that are naturally found in the human body, and does not contain bacteria obtained from soil microbes. ** This item is drop shipped, please allow extra time for shipping. This item does not qualify for any free shipping promotions.